This Just In! Ambient life on Threshold?! Was perusing through some Halo 2 game files today and I found a previously unknown (to me) life form supposedly wafting in the eddies and turbulent currents of Threshold's upper atmosphere! 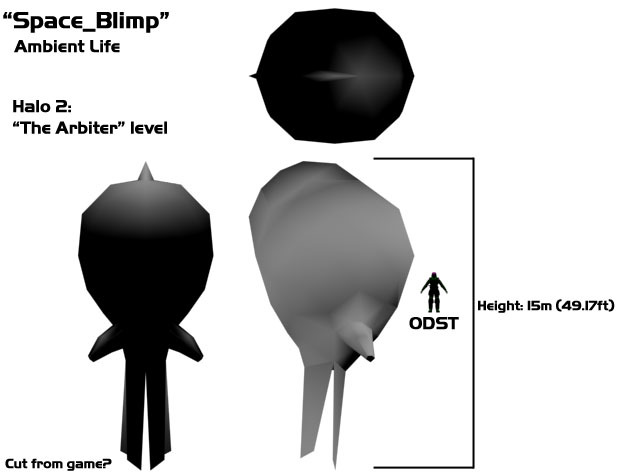 It's probable this was cut from the game but was left in the game files similar to the Huragok from Halo 1. It's in a sub-folder called 'ambient_life' where Bungie would normally keep models of birds, rats, roaches, quadwings, and so forth. Not sure how I missed this before. It's called a Space_Blimp as a model file. It's texture file is a pure beige-yellow color so it's not supposed to have any particular detail apparently. I thought at first this was the Flood Sea Monkey but that's from the second of the Threshold levels, not the first where this creature was found. So I doubt it's even Flood, though there's a resemblance. It appears to be a creature that we'd maybe see floating in the background of Threshold's atmosphere while we battled the Heretic Banshees. What really got me was how big this was! I rendered out a simple shaded form of the model with an ODST to scale. It's huge!! Is this something that's still in the game and we haven't seen it before? Was it cut?